Here's an enlightening concept - better light in the office leads to a more productive workday. Ultra sleek, minimalist, and ready to brighten up any desk, the Desk LED Task Light by UPLIFT is here for the job of making your workspace more well-lit. 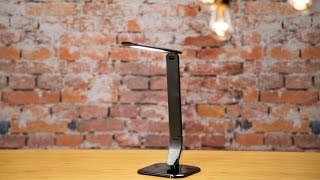 360° range of motion and a unique foldable design make this lamp an ideal addition to any sized desk or workstation. Energy saving LED bulbs let you work without worrying about a dark moment, and boast an impressive 35,000-hour lifespan for all of those late night work sessions. Featuring three color temperature modes and five brightness settings, the UPLIFT Desk LED Task Light is a great accessory to your UPLIFT Desk, or any area that needs a direct light that reduces both energy usage and eye strain. Keep your space in the right mood with a total of fifteen levels of brightness. Available in sleek white, you won't have to sacrifice style when you upgrade to a newer and better form of desk lighting. What is a "task" light? Task lights give you very concentrated illumination on your desktop, which reduces eye strain while working or reading. The sustainable design of the LED light bulbs also conserve energy and make for a long-lasting desk lamp. The UPLIFT Desk LED Task Light is certified for 35,000 hours of use. How does the task light attach to an UPLIFT Desk? The UPLIFT Desk Task Light is freestanding and simply sits on the desktop surface. What is so great about the task light? The UPLIFT Desk Task Light doesn't just turn on and off. You can control the temperature of the light, as well as dim or brighten the light based on your needs at different times of the day. I lost the power adapter for my LED task light. What are the specifications on the AC/DC adapter for the desk light? The adapter needs to have an output of 12V/1A with a negative polarity. Give our Sales Pros a call and we will help make sure you have the right adapter. Are the bulbs replaceable when they burn out? The bulbs are not replaceable; however, the lamp will provide 35,000 hours of light. If you use the lamp every working hour of a 40 hour workweek, the lamp will provide over 16 years of use. That's a lot of bang for your buck! The UPLIFT Desk LED Task Light is available in white. $75.00 List Price: $199.00* The list price is the same as the MSRP (Manufacturer's Suggested Retail Price). It may not necessarily be the price at which the product is sold.